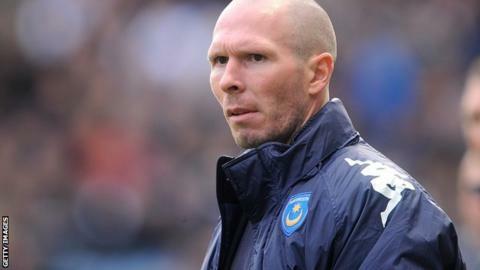 Portsmouth manager Michael Appleton has admitted that the uncertainty surrounding the club is creating a "nervousness" amongst his players. Administration-hit Pompey claimed their first win of the season on Tuesday, beating Bournemouth on penalties in the Johnstone's Paint Trophy. And Appleton hopes it will help kick start their season. "Hopefully this result will be a catalyst for us to start doing well in the league," he told BBC Solent. Pompey saw all their senior players leave in the summer, and are estimated to be £58m in debt. They are currently searching for new owners with the Pompey Supporters' Trust and Balram Chainrai's Portpin vying for control, as the club bid to avoid being liquidated, something which Appleton says has not gone unnoticed by the players. "The game went the way it went because of the situation at the football club," said Appleton. "There is a real nervousness about everyone at the football club at the minute from top to bottom and you can tell that in the play. "So we have to try and control that and concentrate on what we can do on the field and not what happens off it." Up to nine of Pompey's new senior players see their one-month contracts come to an end next week and Appleton says he expects all of them to extend their deals. "I'm fairly confident of keeping the players as they won't be able to play for another club until January," said Appleton. "So I'd be very surprised if none of them chose to renew their contracts." Meanwhile, the club have confirmed that former defender Hermann Hreidarsson is training with the squad in a bid to win a contract. The 38-year-old from Iceland, who has told Appleton he will play for the club for free, left Pompey in January for Coventry but only made two appearances for the Sky Blues and left this summer.